BANGKOK: A corruption watchdog yesterday (July 15) renewed its call for the national anti-graft body to speed up its probes into a luxury watch scandal facing Deputy Prime Minister Prawit Wongsuwon and the money-laundering allegations against a former national police chief. “Three months have passed and all the Anti-Corruption Organisation of Thailand [ACT] has received in response to its open letter asking the National Anti-Corruption Commission [NACC] about progress made in its probes into these two cases is that they still are in the fact-finding stage,” the organisation posted on its Facebook page. The NACC has come under repeated criticism for foot-dragging on the watch case in particular. The organisation also posted a copy of the letter received from the NACC in response to its inquiry. The NACC letter added that the commission has kept the public well-informed about the progress in the two investigations by holding press briefings. All information that could be revealed to the public without breaching any law has been provided through the past press conferences, said the letter, adding that the public will be informed about the outcome of the two investigations as soon as the NACC has concluded the process. Mana Nimitmongkol, secretary-general of ACT, said the NACC response received on July 6 was in response to the organisation’s open letter dated March 26. An NACC source, meanwhile, revealed that a committee handling Gen Prawit’s case had finished questioning all witnesses, but the local dealers of those luxury watches had refused to provide the NACC with any information about the serial numbers of the watches in question. 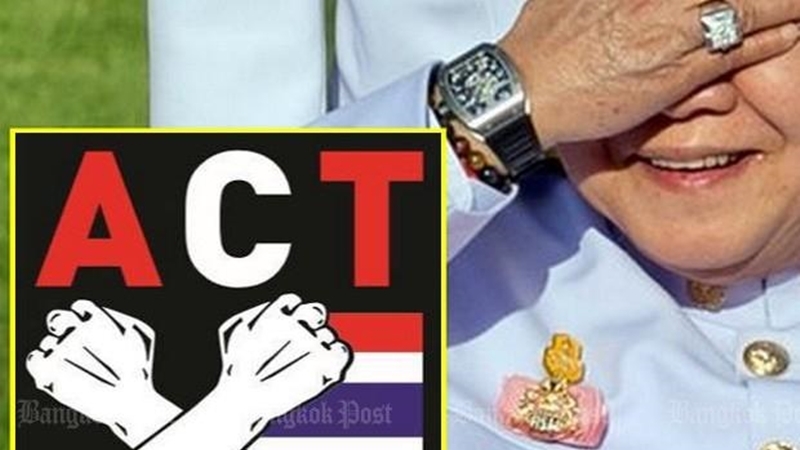 The NACC had sought ownership details of the watches seen worn by Gen Prawit from the local dealers, saying that the information could be crucial in concluding the case, said the source. Earlier in May, NACC secretary-general Worawit Sookboon said the commission needed more time to expand its investigation into the watch scandal and claimed that the wrapping up of the case would depend on the receipt of information from the dealers. The other case involves former police chief Somyot Poompunmuang along with about 40 other individuals, who have been facing a probe since early May by the Department of Special Investigation (DSI) for allegedly engaging in financial transactions with the owner of Victoria’s Secret massage parlour. DSI officers suspected Kampol Wirathepsuporn, who ran the notorious massage parlour and is a major suspect in a human trafficking case, of laundering his assets by transferring them to others. The officials had raided Victoria’s Secret on Jan 12 and found 80 women, including girls from Myanmar, working as prostitutes at the parlour. Gen Somyot and Kampol are known to have been friends with the ex-police chief reportedly having admitted to borrowing B300 million from his “old friend”, sparking a probe by the NACC. Just asking the dealers? Let me laugh. They only can be forced by court order, which the mates of Pom Watchman will block. After all the watch shops want to continue selling expensive watches to rich generals. Of course the dealers have the right to refuse to disclose the ownership information, it's private. THAT is what court orders are for. Get a judge to issue a warrant for the information. Unless you're not serious about your investigation that is?